Obviously missions and parishes at early stages will use whatever space they can get to worship in and it will likely not be the desirable set up. Nevertheless there are some minima which ought to be striven for. If nothing else is available at the outset, a garage can be very well converted to take up to twenty people easily, provided that some small expense is involved in lining the inner walls, carpeting the floor etc. Halls which have to be totally cleaned after the Liturgy and all liturgical furnishings removed, should be only used as a last resort. Anglican or Roman Catholic chapels can be used – Anglican for preference as they are less likely to have statues. Storefront churches have proven quite successful for both Roman Catholic and Continuing Anglicans. A small weekday-manned bookshop can front the street and will encourage passers by who would not visit a church building. The Altar should ideally be around 5’ to 6’ in length (4-5’ if in a garage or similar sized space) and the height of the Priests bent elbow when he is standing. The Altar should always stand against the liturgical east wall. There should not be flowers on or around the Altar or in the Sanctuary; this is a 19th C protestant practice. Ideally the candles should stand on the floor beside the Altar – or behind and reach to head high or be fixed to the wall nearby. Likewise the Crucifix should stand on the floor behind the Altar – or on a ledge behind the Altar or fixed to the wall behind the Altar and reach slightly above head height. While this arrangement is ideal, it is permissable to have two candles and a Crucifix on the mensa. Six candles should never be used, this is a post-reformation Tridentine Roman Catholic practice. Two candles at most. The candles should be a beeswax mixture. 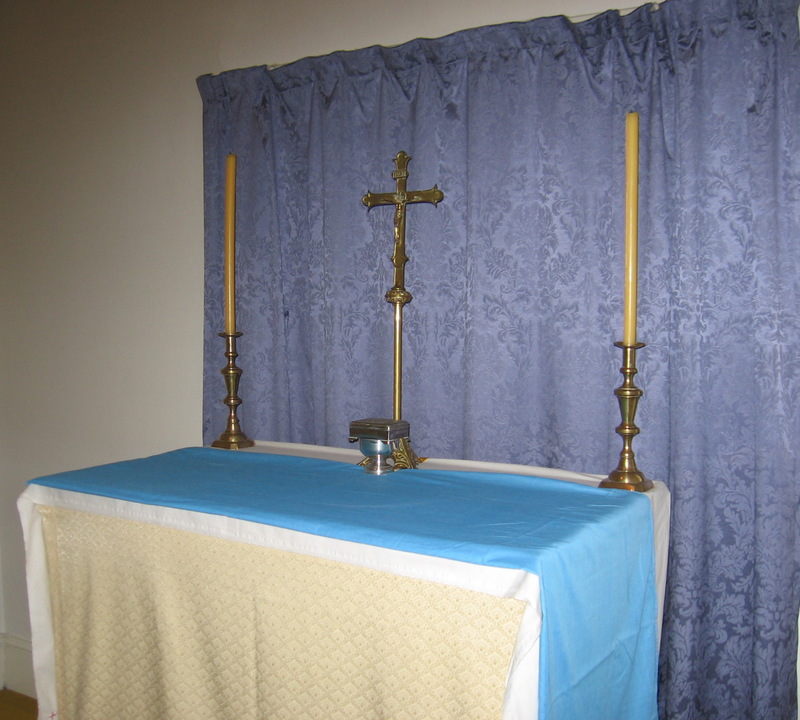 The Altar should have a blue dust cover on it when not in use. The dust cover is blue so that it can never be mistaken for the fair linen cloth. The white linen Altar Cloths: There are two laid one over the other, and hanging down the ends of the Altar to about half way. There should be no lace. If the parish or mission possesses a flesh relic of a saint, it may be on the Altar in a modest reliquary. The Credence table should be large enough for the cruets, wash basin etc and should stand facing inward against the liturgical south wall of the Sanctuary. The Credence can of course also be a shelf affixed to the wall on the south side. The Credence should not be a focus of attention. The Chalice and Paten. The Paten should ideally be a footed Paten as was commonly used in times past and which is still made today. It is easier and safer to use than the modern Roman flat discos style. While gold is a very suitable metal for the Chalice and Paten, nevertheless, silver is quite appropriate. The inner surface of the Chalice can appropriately be gold plated. The Chalice and Paten should never be left out in an unlocked church, but should be locked securely away. The Rood Screen. Even in a tiny space, there is no excuse for not having a simple Rood Screen. It has been part of west European churches for around fifteen hundred years in one form or another. The Rood Screen effectively divides off the Holy Sanctuary from the rest of the church. Even in halls, a moveable Rood Screen can be made. 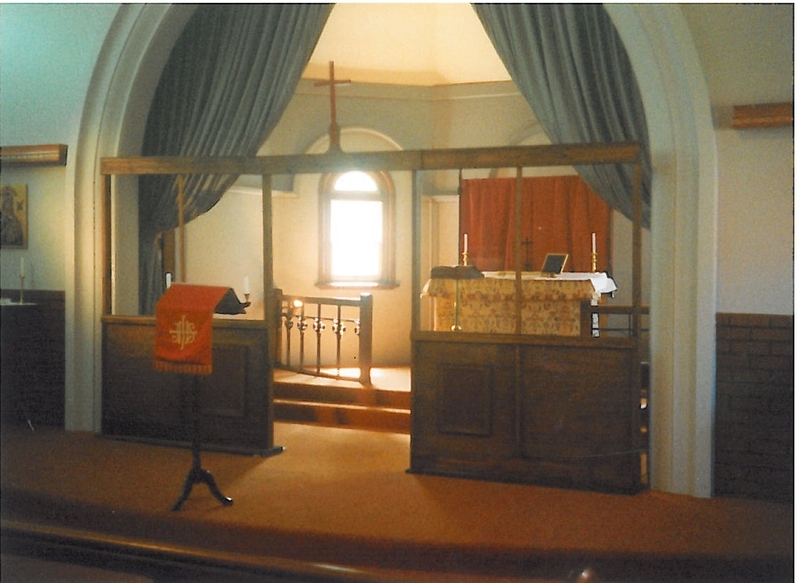 Below is a photo of a removeable Screen which was used by an Orthodox Western Rite mission in a borrowed Roman Catholic chapel. It was made in three parts with the beam above the centre joining the two sides. 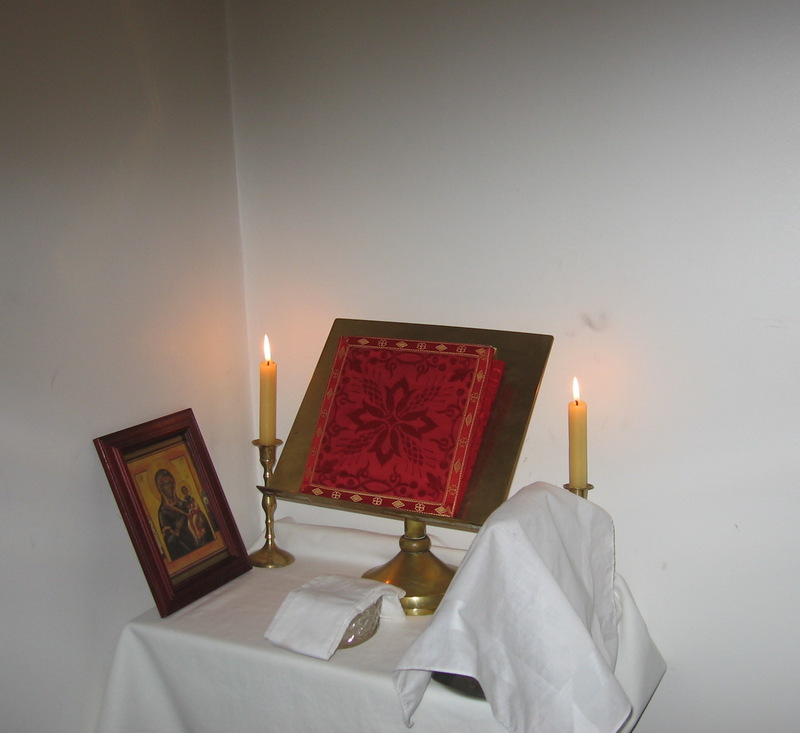 The Eulogion table is a small table with a white cloth on it, set outside the Rood Screen, facing the people. On it is set a platter with the Eulogion bread, a bowl of holy water and an aspergillum with which to sprinkle the Bread (see left side of the RCC chapel above). Vestments. This is a somewhat vexed question, nevertheless there must be rules. In the first place Baroque Roman Catholic vestments are not permitted under any circumstances. The so-called “fiddle-back” chasuble has no place as a late, inelegant, five hundred years after the Great Schism form. Only Gothic or conical or full width rectangular chasubles are permitted. Albs must be plain white linen without ornamentation or lace at all. The Amice must be worn in the traditional manner. The Maniple is required to be worn. The cincture must be plain white. A Priest’s stole is always crossed over the chest and secured by the looped cincture. The Amice is never tightly wrapped around the neck but is loose falling above the chasuble. A Vesting table in the Vestry chapel. The Chasuble is laid out flat, with the Cincture crossed over it, the Alb over that, the Amice on top with its tapes neatly crossed. The Amice stays over the head until the Chasuble has been put on and the pectoral Cross. Then it is pulled back over the Chasuble. Alb over cassock and Amice, securing the Stole by looping the cincture. 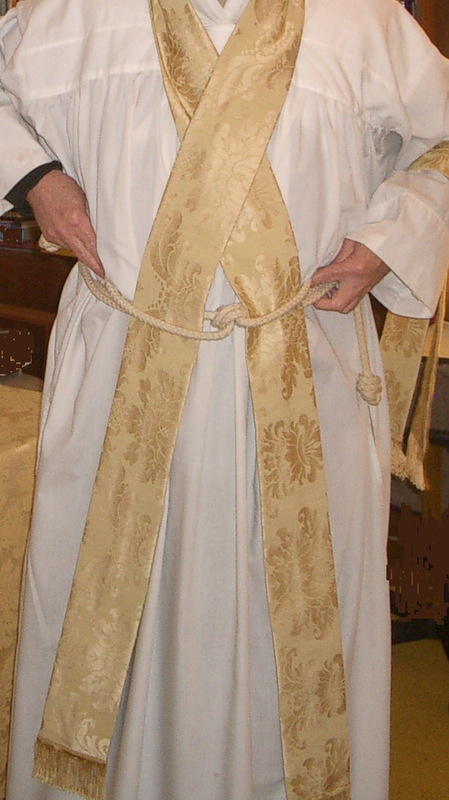 A Bishop wears the Stole straight down on either side, secured by the Cincture loops. In conformity with usual parish pre-schism practice, the Chasuble should be as plain as possible. A gothic Chasuble with orphreys is of course acceptable. Vestment colours: The ancient practice is for blue during Advent, gold at Holy Nativity, plain gold during Epiphany until Lent, murrey during Lent, gold at Easter and for the Sundays thereafter. Red is used on Trinity Sunday and for all Sundays thereafter until Advent. Green is a more modern Roman Catholic colour and should preferably not be used. A responsible person with time and patience should be appointed to care for vestments and linens. Nothing worn in the sanctuary should be unironed, stained or otherwise sloppy. This should all take around two plus hours. All statues to be removed. No Altar may have a tabernacle on it. 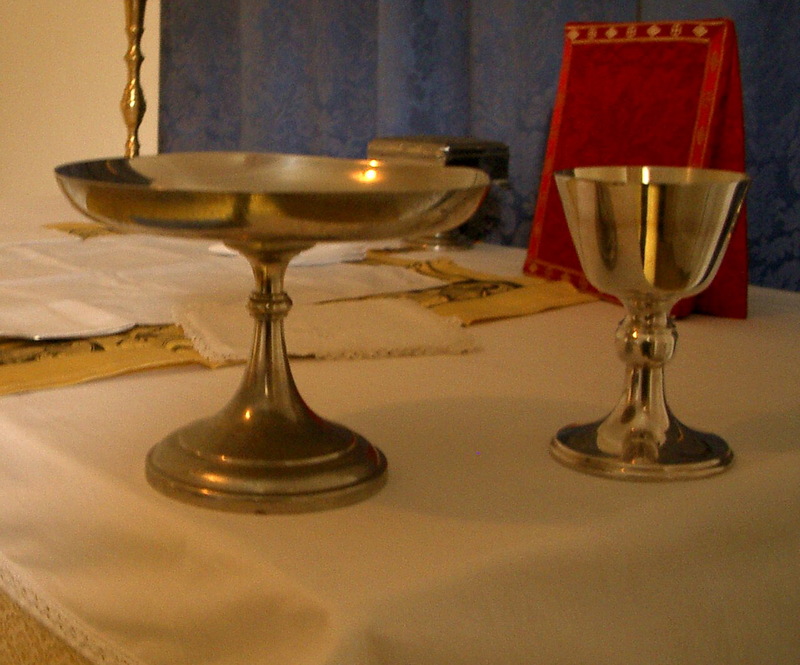 If for pastoral reasons the Sacrament must be reserved with the written permission of the Bishop, then an aumbry or hanging pyx is permissable in a permanent place of worship. Multiple tinkling sanctus bells must not be used. A single bell that is struck may be used. There is only one fully authorised Western Rite Prayer Book in the Russian Orthodox Church Outside of Russia, it is the Saint Colman Prayer Book authorised by his Eminence Metropolitan Hilarion in 2003. It contains the authorised Liturgies of Saint Gregory and Sarum and the occasional services and Offices used by the Parish throughout the year, including the Rites of Holy Week. No other liturgies may be used henceforth. If their jurisdiction is Old Calendar (Moscow Patriarchate for instance) Western Rite parishes must all follow the Old Calendar, and observe all major common feasts and fasts at the same time as their Eastern Rite brethren. Western Rite however has some extra fasts which ought to be observed (see the Saint Colman Prayer Book). The Western tradition is to observe Trinity Sunday and to count the Sundays thereafter until Advent Sunday as Sundays after Trinity. Western Rite Priests should familiarise themselves with the Liturgy of Saint John Chrysostom and should celebrate it on at least one common major Saint’s day during each month. It is not necessary to change the church or use eastern vestments. The Liturgy of Saint John Chrysostom was celebrated in vestments similar to present western vestments during the first millennium. It is strongly recommended that all Western Rite Priests undertake the distance learning course run by (Joensuu) University of Western Finland. This is the theology and practical course done by their clergy, it is in the Russian tradition and is extremely cheap. The course is entirely in English. At the end of the course, clergy should give their Bishop the certificate awarded to show that they have completed the course. Western Rite parishes are an integral part of every diocese. Clergy should attend clergy meetings, concelebrate with the Bishop and other clergy and generally participate in all diocesan affairs and ensure that their parishioners join the local eastern rite parish for their patronal festival and participate in the local arrangements for the Sunday of Orthodoxy. Each diocese has one bishop, we are one Church, we are not divided and we should go out of our way to ensure that everyone understands this clearly.